This stunning Toulon cloakroom suite benefits from a designer style that will not only look fantastic in a contemporary setting but will maximise the limited space. Boasting modern and sleek features, this suite will give your bathroom a trendy and stylish feel. 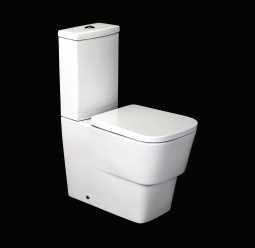 The angular design of the toilet will give all bathroom suites a contemporary touch. The cistern features a dual flush push button which offers a high and low volume flush, meaning you will be receiving a highly efficient toilet – perfect for those with larger families and their toilet is constantly in use. The toilet also features a luxury soft close toilet seat. A soft close toilet seat will help to protect the pan from getting damaged if the lid should be accidentally dropped, this is thanks to the slow and silent closing process – no more loud bangs. Whilst still sticking with the designer style, the Toulon basin and pedestal also combines the practicality that is essential to everyday family life. The slender nature of the basin and pedestal makes it the perfect item for this cloakroom suite as it doesn’t take up much floor space, thus leaving you with plenty of floor space. For added flexibility the basin is also supplied with one tap hole, making it suitable for a mixer tap. If you want a suite to perfectly complement your new family bathroom, cloakroom or ensuite then the Toulon toilet and basin set could be just the one. With flawless detailing on both the toilet pan and wash basin it’ll look fantastic in any setting it’s installed in, especially with its white high-gloss finish. Underneath the impeccable surface is precision cast vitreous china, a durable and robust bathroom material that not only looks good but is easy to clean. Getting in all the nooks and crannies of your toilet seat can be a bit tricky so the Toulon seat comes with a top fix system so you can not only fit it fast but easily access those hard to reach areas. This isn’t its only trick either, it’s designed for comfort and style while also benefiting from a soft close mechanism so you’ll never bang the seat by dropping it again. We don’t like to waste water here at Plumbworld so we ensure as many as our toilets feature a water saving cistern. Don’t worry though, they aren’t under underpowered, they simple allow you to select either a large or a small flush depending on the waste you need to get rid of. This ingenious mechanism is controlled using a stylish chrome push button which is discreetly fitted to the cistern lid. The basin itself has a wonderfully spacious bowl with ample space for washing or cleaning teeth. Positioned above the bowl is the pre-drilled, centre-mounted single tap hole which allows you to fit a basin mixer tap. Basin mixer taps are so much more efficient than traditional, separate hot and cold taps because they offer precise control over temperature without having to fill your sink first. You might think pedestals are old news but they actually serve a number of useful purposes, and when they’re as sleek as the Toulon’s you barely notice they’re there! Firstly they take some of the weight of the basin, reducing the weight on the wall fixings. Secondly they hide any pipework from the tap and waste, making things neater and more minimalistic. Lastly they look great finished in the same high-gloss as the basin. Ideal for a smaller bathroom. Looks pricey. Excellent customer services and delivery.